When critical self-talk arrives, its message is rarely welcome. Little surprise. Acid-laced quips like “How can you be so stupid?”, “Wow – so typical of an idiot like you!” and “Give up, loser!” score low as great conversation openers. It may seem an impossible task to find silver linings in sentiments like these, yet – as you’ll see – it is possible to welcome, appreciate and even love our caustic self-talk. take it squarely on the chin and concede the critique as fact. The problem with these responses is they do nothing to temper or transform the cantankerous relationship we have with our caustic self-talk. There’s no room for negotiation, developing understanding or collaborating on positive outcomes. Even with the wealth of strategies out there for sorting out the most challenging differences between individuals and groups, we still tend to see our adversarial relationship with our caustic self-talk as “the way it is”; a fait-accompli we’re each sentenced to accept grudgingly through all our days. I’ve developed a 3-step process that’s been effective in creating constructive – and yes, even loving – relationships with our caustic self-talk. Take a few short minutes and try it for yourself. Franken-strosities: these most resemble the monsters in children’s nightmares: needle-clawed rat-mutants and venomous winged worms give you the general idea. Disembodied Spectres: these nemeses resist being observed directly: looming shapes, bottomless voids and dark nothingness. Authoritarian Figures: parental and authority figures are particularly common when self-talk is laced with imperatives like “must”, “should” and “have-to”. Whatever their form, these 3 types of nemesis share one common characteristic: their ability to pack an emotional punch geared to grab your attention and trigger an immediate reaction. The nemeses my clients describe remind me of the titular character from The Wizard of Oz. 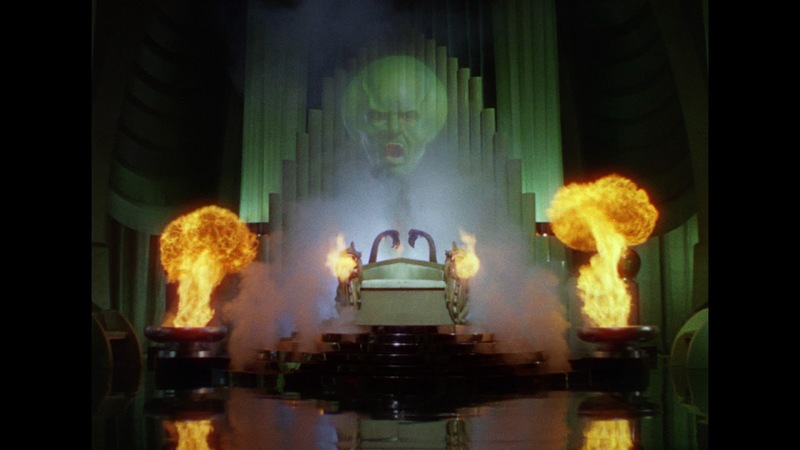 When we first meet the wizard, he appears as a fearsome floating head framed in flames and fury – a potent mix of Franken-strosity and Disembodied Spectre, seasoned with a dash of authoritarian parental figure. Only later do we learn this apparition is a sham: an elaborate contrivance controlled by a hidden puppeteer. Take a second look at that nemesis of yours. Take a virtual walk around it. Give its metaphorical tires a kick. You’ll see that its imposing countenance is actually no more substantial than the wizard’s fiery head. In the Land of Oz, the hidden puppeteer is revealed simply by pulling aside a curtain. You can do the same thing with your nemesis: pull aside the curtain right now and meet the puppeteer closeted within. If your experience is anything like that of my clients, the identity of your hidden puppeteer will come as a complete surprise. Your hidden puppeteer might be a baby or puppy, a flower bud or duckling. Whatever its form, you’re more than likely face to face with something small, vulnerable and irresistible cute; a presence that, on its own, would never command the fear and tyranny wielded by its formidable nemesis persona. Why does a baby cry? A puppy whine? No one would ever describe these sounds as pleasant or soothing, yet the reactions they stimulate are very different from those of putting up your dukes, running and hiding, or just taking it on the chin. On the contrary, our usual reaction is to do whatever we can to ease the sufferer’s distress. While these sounds undoubtedly involve us, they’re clearly not about us. The most powerful resource your hidden puppeteer has is its ability to provoke strong emotions. Like any baby or puppy, it uses this ability whenever it experiences discomfort to monopolize your attention and redirect your behaviour. Learning to respond with love and caring to calls of distress from our hidden puppeteer makes life easier for our selves. It can also bring unanticipated benefits as well. Many of my clients have been surprised to discover that making peace with their hidden puppeteer reduces their caustic self-talk substantially. And there’s an added bonus: given time, their hidden puppeteer matures! In place of interrupting with button-pushing generalizations, self-talk now arrives bearing constructive inspiration with “out-of-the-blue” suggestions and solutions. Learning to love our caustic self-talk, it turns out, offers a powerful doorway to change. With it we can re-channel once-endless bouts of inner conflict towards common purpose; shared goals to which we and our hidden puppeteer can both wholeheartedly commit.